Local Body Elections are coming up soon and it’s important that we all vote. One of our Maungaharuru-Tangitū Trustees, Kerri Nuku, is a candidate for the Hawke’s Bay District Health Board. 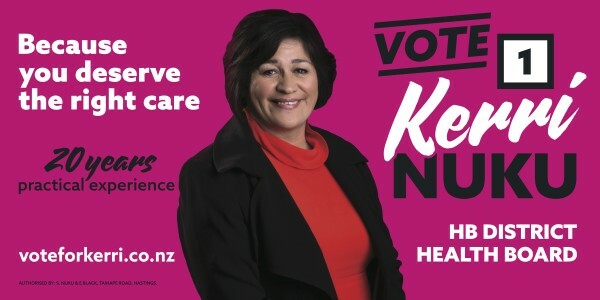 “I have over 20 years practical experience and I am standing for the Hawke’s Bay District Health Board because you deserve the right care.” Kerri Nuku. The local body elections run from Friday 16 September to 12pm Saturday 8 October 2016. You should receive your voting papers in the mail between 16 – 21 September. Born and raised in Napier I moved to Hastings nearly 30 years ago when I married. I live in Hastings with my husband, six children, son in law and two beautiful grandchildren. I am the President of the New Zealand Nurses Organisation which represents and advocates for over 47,500 nurses across New Zealand. I was elected in 2009 and have stood unopposed for the past 3 elections. I have worked as a nurse and midwife in Hawkes Bay for over 20 years and absolutely loved working for our communities. I am a very vivid sports parent and along with my husband spend the week days and weekends watching and supporting our children to their different sporting events. I was a Ministry appointment to the Trustee for Te Aute College and now an elected representative. I am a Trustee on Maungaharuru-Tangitū Trust, and member of the DHB Māori Relationship Board to the District Health Board, a member of the Clinical Council. I a member of other focus groups. I am also a member of the New Zealand Institute of Directors. I believe I can make a difference by taking practice experience and local knowledge and making the best decisions for our community. I believe that we need to invest and plan for our health future. We should not be one of the worst performing DHB’s in the country for faster cancer treatment, we must ensure faster access to services. Everyone deserves the right care when you need it, regardless of where you live. Authorised by: S. Nuku & E. Black, Taihape Road, Hastings.